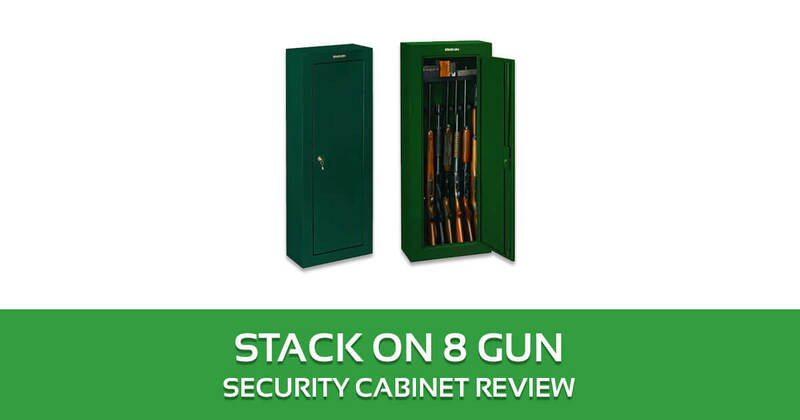 It’s not uncommon for many US households to keep several hunting rifles at home, which is where Stack-On 8 Gun Security Cabinet comes in. In 2012, about 31% of all households had a gun in the home—as well as a child. That’s not really a very safe situation with unsecured guns. After all, we’re talking about 1.7 million children living in a house with firearms. It can get very dangerous. There were 113 children deaths in 2104 due to the accidental discharges of firearms. That’s not even considering the risk of having these firearms stolen by burglars. 1 Who Needs the Stack-On 8 Gun Security Cabinet? It offers a secure storage compartment that casual thieves and children can’t beat easily. It will take more than a hammer and screwdriver to defeat the lock. The inside is designed specifically for shotguns and rifles. You have slots for each rifle where they can stay in place, and they won’t get scratched. You can easily put this on an upper floor without worrying if the floor will give way. It’s easy to move up the stairs. It looks nice wherever you want to put it. Who Needs the Stack-On 8 Gun Security Cabinet? This is for those families and households who own just a few guns for hunting, such as rifles and shotguns. 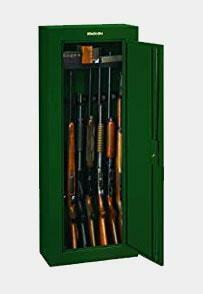 As long as you don’t go more than 8 guns in your collection, then the Stack-On 8 Gun Security Cabinet will suffice for your needs. It’s really important that families with children get this type of gun storage compartment. It’s secure, and children can’t get the firearms without your permission and supervision. These are some of the features of the Stack-On 8 Gun Security Cabinet that has made it quite popular. You have to understand that this is a basic gun cabinet, and not a top of the line gun safe. This is designed to be used for hunting rifles and shotguns that can keep unauthorized people from getting the firearms easily. That means kids can just open it and play with the guns, which is very dangerous without you or other adults around. The basic premise is simple. It’s a cabinet with a lock. You just keep the key with you at all times, and no one can just casually reach in and use your rifles. In general, you don’t need anything more sophisticated than this setup. The basic principle is that you don’t want it to be easy for others to get to your firearms. With this, the lock can be difficult to beat even with a hammer and a screwdriver. This cabinet is designed specifically for long guns. That’s why it’s 55 inches tall. It’s meant to accommodate rifles that are 52 inches long. Even slightly longer rifles (up to 54 inches long) can be arranged to fit inside. There’s a removable shelf you can take out so you can store the longer firearms along the cabinet back wall. The barrel rests to keep your rifles secure in their place. The standoffs keep most rifles with scopes away from the back of the cabinet. There’s also a foam pad at the bottom so that you don’t scratch the stock of the rifle. Its weight is also light enough for upper room floors. When you use heavy 500-pound gun safes, upper floors won’t be able to hold them up securely without suffering damage to the floor. Thieves can’t just pick this up either. That’s because you can just bolt it to the floor and wall. It’s not all that difficult to do since you already have the holes pre-drilled. You don’t even have to buy the fasteners since they’re already part of the purchase. You can put in 6 rifles and shotguns side by side easily. With some planning, you can also put in 8 rifles inside. That’s not all. There’s also a top shelf where you can put ammo and cleaning paraphernalia. You can pick the cabinet in either black or green color. Either way, it looks good in your bedroom, living room, or “man cave”. It offers sufficient storage space for a few rifles. That means you don’t have to fork over extra money for storage space you won’t use anyway. The contours and features inside are specifically meant for rifles and shotguns. It’s not a generic cabinet where you can put in anything. Here, the design keeps your rifles fee from damage and scratches. It’s very easy to use. You just use the key to lock it and open it. It offers basic security that keeps casual thieves and children from touching and handling your rifles. People can’t break the lock easily, and they can’t just pick it up either. It looks nice wherever you put it. It’s a gun cabinet, not a top of the line safe. A determined thief can get inside given enough time. The size means that you can’t use this for hunting clubs and groups with more than 8 rifles. Can this hold an AR-15? Yes, it can. Lots of customers have confirmed this. What happens when you lose your keys? You’ll need to contact the manufacturer to get new keys. That’s why the first thing you need to do is to make extra copies of the keys, which you can put in your workplace or in a bank safety deposit box. When you or your family has several riles at home, you need the right storage compartment for them. You can’t just leave them wherever you want. That’s why you need the Stack-On 8 Gun Security Cabinet. It secures your rifles, and the storage compartment is contoured for the shotguns and rifles. It’s the affordable and effective way to store your hunting firearms.